Black Market Labs was one of the last companies to remove the notorious 1, 3 dimethylamylamine from their pre workout products. This potentially deadly ingredient, which was popularized by pre workout 'Jack3d' from USP labs, has been banned by the FDA, and is forbidden from being used further. The ban, which was implemented over a year ago, apparently fell on deaf ears over at BML, who continued to sell their 1,3 containing product 'Adrenolyn Bulk' as late as April of this year. This is frankly saddening that a company would continue to distribute potentially harmful products to the market. Supplement companies have a responsibility first and foremost to ensure the safety of their customers- and Black Market Labs lost some cred in our book here at BPW4W for failing to do so. Rant aside- the pre workout supplement for women Adrenherlyn arrived at our door about half-way through this years best pre workout for women testing cycle. Having already sampled several of these products, we had a good idea of what to expect from this formula. Breaking down the ingredients panel- we hypothesized that Adrenherlyn would provide some serious mental stimulation, courtesy of the potent (and questionable) combination of caffeine and citrus aurantium. As you may or may not know from reading our other reviews- you should stay away from citrus aurantium if you are an NCAA collegiate level athlete- because the ingredient is currently on the banned substance list! Other musings from the supplement facts panel were that this pre workout drink would probably do well in the fat-burning department- courtesy of active compound L-Carnitine L-Tartarate. This ingredient is finally getting the attention it deserves as a proven fat-burner, and we give Black Market Labs some credit for that. Another interesting add-in to Adrenherlyn is chromium- a common supplement used among diabetics because of its ability to support blood-sugar regulation. "...did not like the product taste AT ALL, but felt super-energized during the beginning and middle of my workout. Also, may or may not have been a direct result of Adrenherlyn, but I found myself getting very anxious and jittery towards the end of my workout- and especially noticeable post-workout..."
"...I don't have much to report as far as actual performance effects. My workout went down relatively smoothly after taking a scoop and a half of Adrenherlyn. It might be that I took the product too close to my workout because I didn't feel anything towards the very end-- and then it wasn't a great feeling. My face felt hot and itchy, and I was jittery in general." 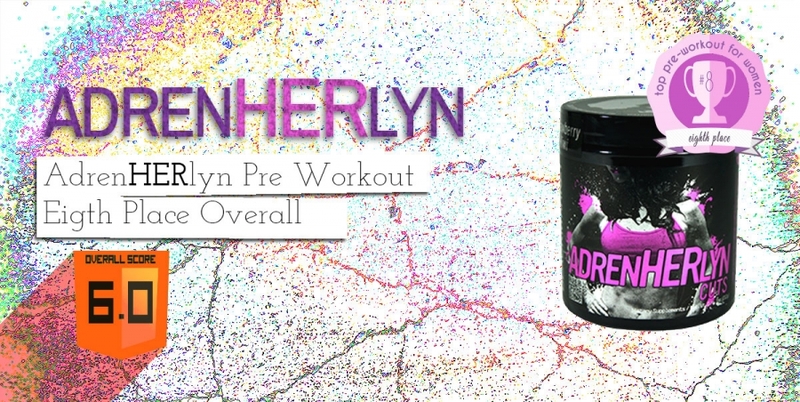 "Adrenherlyn was one of my favorite pre-workouts for weights, but after trying it for cardio, I don't think I'd ever try it again. I legit felt sick and almost like my heart was beating out of my chest. I really did not enjoy the sensation that Adrenherlyn provided during the highest intensity moment." These three quotes stood out to me because they honestly aligned with my own personal experience to paint a really clear picture of the type of product that this is. It's hard to explain the effects until you try the product- but think of those times when you had a little bit too much caffeine on an empty stomach. It's a jittery, shaky, 'I don't like this feeling' sort of sensation, and it's what you get after about an hour of taking Adrenherylyn pre workout. That being said, not every member of the panel mentioned this effect- but it's a constant that numerous testers reported. As for why this product causes discomfort- it's possible that the reason is that it's a men's product re-packaged for women. Yes, we've heard this story before. The company takes their men's product, aka 'Adrenolyn cuts', trims down the scoop size, slaps a pink label on it, and viola! we have a pre workout for women. This is exactly what you should expect from Black Market Labs. The guys behind the gas masks have proven to be just as shady as they appear. After trying Adrenherlyn, I would completely 100% advise against taking this product unless you have a very high stim tolerance and a cast-iron stomach. And no taste buds. Strawberry Kiwi was barely drinkable.